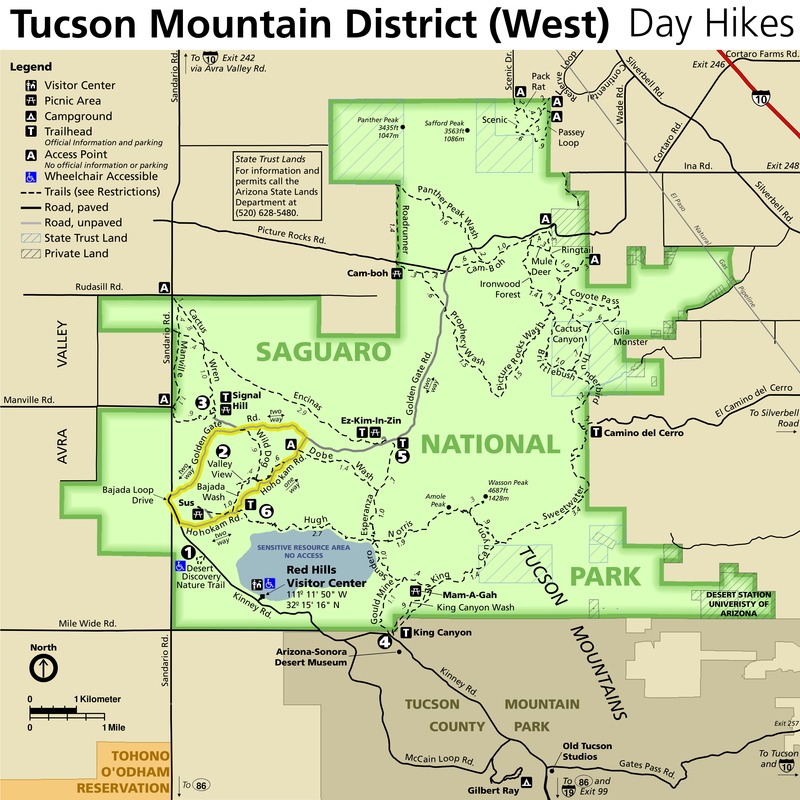 The Tucson Mountain foothills in Saguaro West National Park offer many trails that can be pieced together for various length hikes. 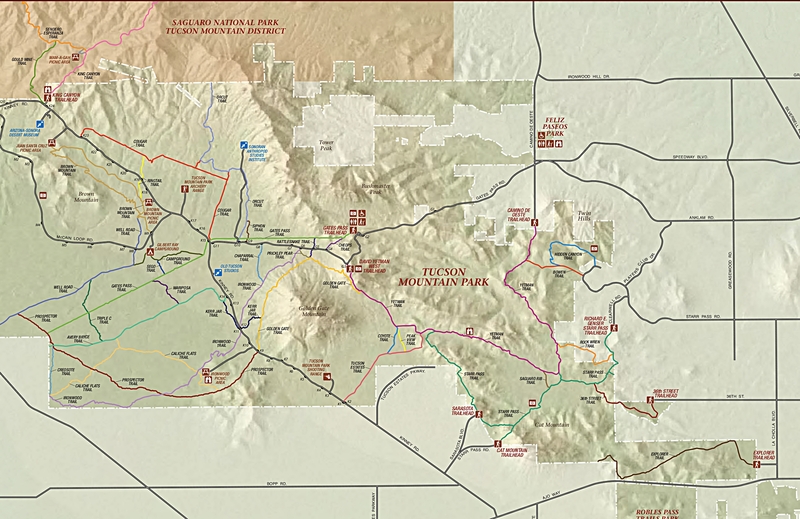 I put together a nice lasso loop that rambles through the low desert foothills, perfect for early morning summer walks and daytime winter strolls. It rolls through pristine desert and huge saguaro stands. 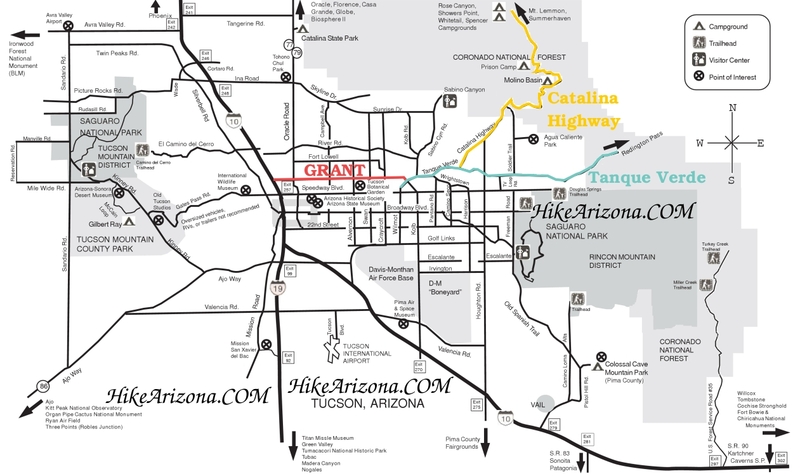 By connecting the Coyote Pass trail with Cactus Canyon via the Gila Monster trail, you have a perfect short and easy hike. 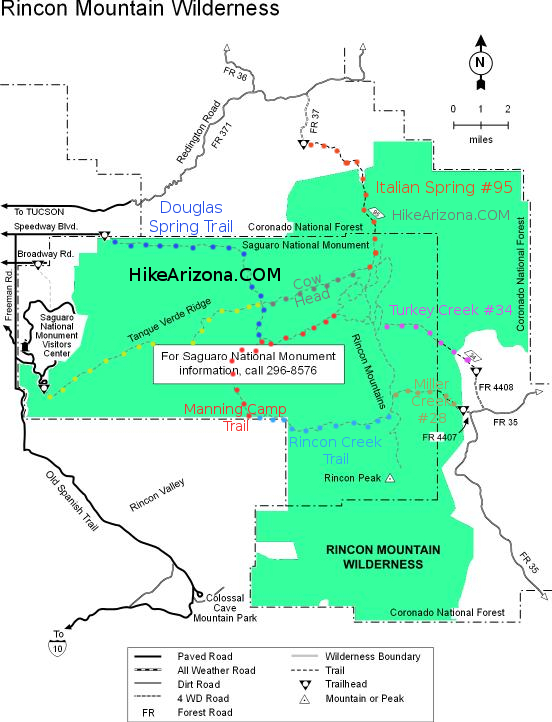 Start this hike from the Ringtail trailhead which I have described before under the Cactus Canyon hike. This pleasant trail starts off in a wash and heads east and south around the base of Picture Rocks to your left. Almost immediately the Camboh trail breaks off to the right. As you stroll along a little farther another signed intersection for the Mule Deer trail breaks off to the right. Just stay on the Ringtail. It crosses a couple of washes and just generally meanders through the desert until it ends in a wide, sandy wash known and signed as the Picture Rocks wash. The Ringtail runs a total of one mile before ending in this wash. There are some nice views out to the Catalinas along the way too. Turn right into Picture Rocks wash and follow it for about 0.4 miles. 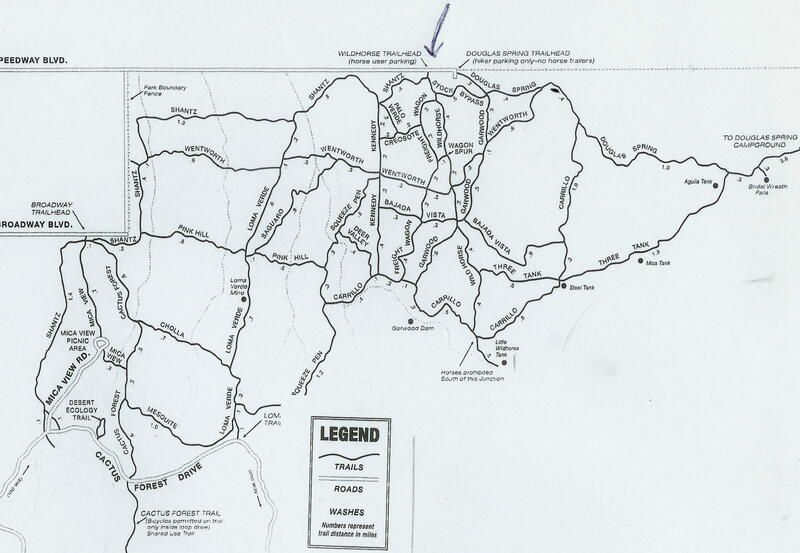 A signed trail will break to the left out of the wash. Take it as it climbs out for 0.2 miles where the trail splits at a signed intersection. Take the left fork to Coyote Pass. This short trail cuts through perfect desert, first dropping slightly to cross a wash then slowly climbing to the Coyote Pass. From the pass you can see out over Tucson. A gradual descent follows into a wash and after a total of 0.8 easy miles you dead-end in another signed wash. This is the Gila Monster trail. Take a right here and follow the more narrow and rocky wash. In the early morning hours there will be some blessed shade. Within 0.1 miles a small signed trail breaks out to your left, the Windmill trail. Stay in the wash as it narrows down. At about 0.3 miles along the way, the wash takes a hard left and a visible trail goes straight. Stay on this straight path as it climbs away and to your right towards the backside of Cactus canyon. After a total of about 0.7 miles you come to a sign announcing Cactus Canyon. This is apparently the end of Gila Monster trail. Just keep going. Cactus Canyon is chock full of magnificent saguaros. It tops out on a small pass giving great views out over Picture Rocks and Panther Peak. After a total of 0.7 miles on Cactus Canyon you are back at the intersection with Coyote Pass. Keep going back to Picture Rocks wash and hang a right. Follow the wash back to the Ringtail, which breaks out of the wash to your left. From here it's back to the trailhead. From Tucson take exit 246 off I-10 and go west on Cortaro until it ends at a T. Turn right here onto Ina for a short distance, then Left onto Wade. Wade quickly becomes Picture Rocks Road and crosses through the Tucson Mountains. 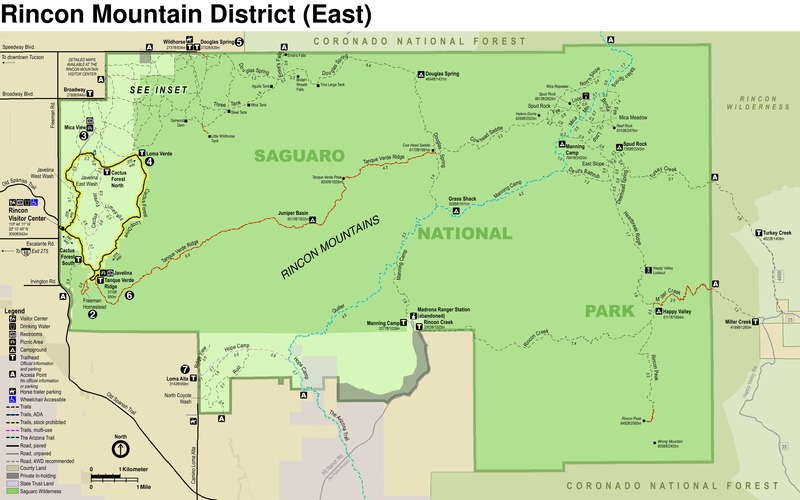 You'll see a couple of signs announcing Saguaro National Park. As you come down the west side of the mountains the road swings hard to the right and there is a paved pull out area to the right. Park here. The trails take off just across the street.